WILD BILL COOKSEY: LAS VEGAS GUINNESS BOOK WORLD RECORD BREAKER! This Video Has The Original Version Of The Song In The Background. But In The Player Below You Get To Hear The 30 Year Update Version With The Very Special Second Verse That I Could Only Write After I Understood What The Whole Event Had Been About! Don't Miss That Second Verse....And Keep On Climbing To The Top! CLICK HERE To Play The Audio On Windows Media Or Right Click To Download The Original 1976 Version Of The Mt. Song As Recorded In The Studio And Was Included As A Bonus Insert With All Those Who Received Copies Of The First Printing Of The "I'll Climb That Mountain" Book. This Video Has The Lyrics And Music To The 2007 Version Of The Mt. Song, Including The New Second Verse. If The Player Does Not Immediately Begin When You Click On The Button, JUST CLICK ON THE WORD "DETAILS" At The Bottom Of The Player Icon." Then The Song Will Play ASAP In A New Window. And When You Click Back To This Page, This Player Should Have The Song Loaded Up To Play. This is the story of a man, a dream, a world record, a lesson of life and a song written many years before the writer truly understood what the words really meant. "Thank You, Jesus, For Helping Me To Climb That Mountain Yesterday!" Click This Link To Hear The 1976 Version Of The Song Wild Bill Wrote For A TV Documentary About How 20 Years Earlier He Had Been Told By Doctors That He Would NEVER Walk Again. Note The 1976 Version Did Not Include The New Second Verse Added In 2007. It Took That Long For The Songwriter To Understand The Complete Message Of The Song. Enough said......Now be my guest and enjoy the story that led to the writing of the song and the book......Share it with a friend who likes to laugh and cry! WILD BILL WOULD LOVE TO HEAR FROM YOU! 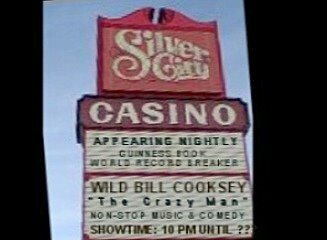 MAYBE YOU WERE THERE AT THE SILVER CITY CASINO THE DAY HE BROKE THE WORLD RECORD?!?! OR DID YOU SEE HIM IN CONCERT IN ANOTHER CITY? SURELY, YOU DIDN'T MISS THE SPECIAL THAT THE VH1 TV CREW FILMED IN VEGAS AT SILVER CITY ON THE TWENTY-FIFTH ANNIVERSARY OF THE BIG EVENT? Click Here to SEE WILD BILL'S ON STAGE ACT plus all the Rock and Roll Hall of Fame Members and other celebrities Cooksey has performed with in concert. Yes, Wild Bill is still out there kicking down new doors, reaching new audiences with his talents and even recording new songs that have gained international fame.